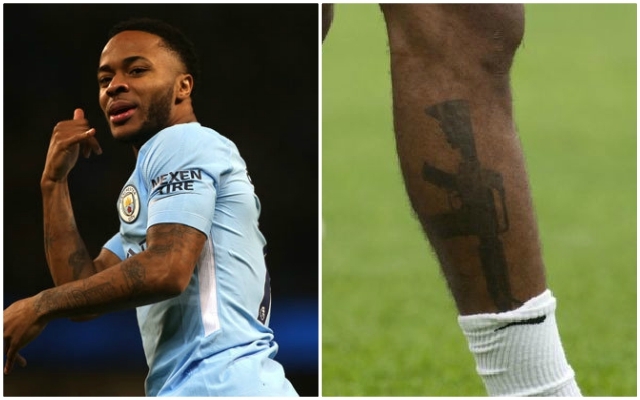 Manchester City and Belgium star Kevin De Bruyne has defended teammate Raheem Sterling following criticism surrounding a tattoo of a M16 assault rifle on his right leg, according to Sky Sports. Both players starred for Manchester City this term when they helped the Manchester outfit to their third Premier League title; accumulating a record 100 points – a first in any English top flight history. However, they will face each other in a potential World Cup clash when Belgium and England face-off in the last game in Group G.
Sterling has been forced to defend himself following the controversy of his tattoo and De Bruyne could not understand why he is continually criticised and spoke glowingly about the England international’s character. “Raheem is an unbelievable player,” said De Bruyne, as per the report from Sky Sports. “When he plays for England I don’t know what happens but there is always criticism about Raheem and I don’t know why. “He’s a very good guy, he’s one of my guys and we’ve been together since day one. We have a good chemistry, we play well together and he’s only 23. As per another report from Sky, Sterling said in an Instagram post that the tattoo was a tribute to his late father who died after being shot when Sterling was two-years-old. He is currently preparing with the England team ahead of their international friendly against Costa Rica tomorrow and last week Southgate backed the player’s character and said he perceives tattoos as an expression of individualism. “Raheem is a very strong character. He is focused on his football. I’ve had a good, deep conversation with him just to see how we was with everything,” said Southgate.